Opening alongside Open Studios, Factory Makers curated by Kari Conte initiates a four-part exhibition that takes ISCP’s site of production – a historic printing factory – as the starting point to reflect on the changing nature and idea of work in society and how we define labor today. Participating artists include Matei Bejenaru, Factory of Found Clothes, Cao Fei, Chen Chieh-jen, Jean-Marc Superville Sovak, Stephanie Syjuco, and Mladen Stilinović. This exhibition presents seven international artists who address the impact of the world’s rapidly changing economies on new social and cultural realities. Through various approaches, the included works consider the effect of globalization, new modes of ‘outsourced’ production and the blurring boundaries of material and immaterial labor. 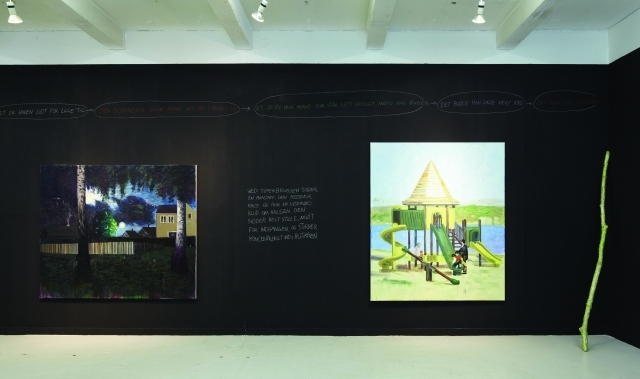 A 1978 work by Mladen Stilinović begins the exhibition and asserts non-productivity as critical to the creation of art. 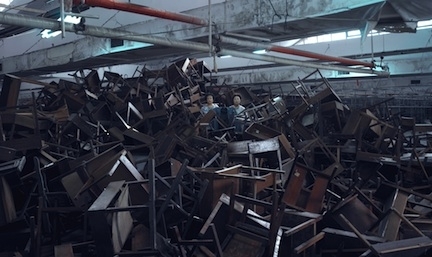 Cao Fei’s video stills My Future is Not a Dream are part of a project in which the artist spent six months at a lighting factory in the Pearl River Delta, a region that has been an epicenter for China’s rapid economic growth. During this time, Fei set up workshops with the factory workers and asked them about their dreams. According to her, “most of the workers left their hometowns in pursuit of their ideal and dream in the Pearl River Delta area.” In the piece she focuses “on the innermost feelings of every individual in this globalized production chain, this giant and complex system of business, placing them at the center of attention, so as to let them rediscover their personal value which is often neglected during the process of creating huge business value.” The photographs show a worker holding an electric guitar and a group of the workers who formed a band as a result of the project. Matei Bejenaru’s video Battling Inertia tells the story around the history of the ‘Fight Against Inertia’ poetry club which has been active since 1973 at C.U.G. – Industrial Platform for Steel Processing in Iasi, Romania. It is filmed at the club’s former and current site: the industrial platform in Iasi. Bejenaru attempts to memorialize an idealist way of living, where the workers from a communist factory bound poetics to everyday life. 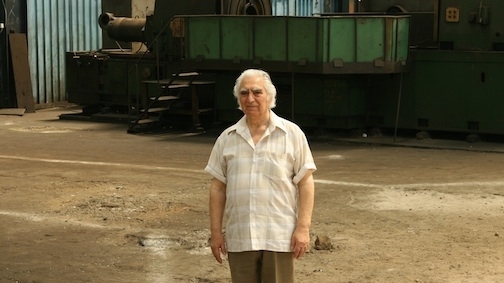 The video shows a melting point between the individual and the industrial machine while reflecting on the conditions of material and immaterial work. Kazimir Malevich insisted that “There is no art without laziness”. 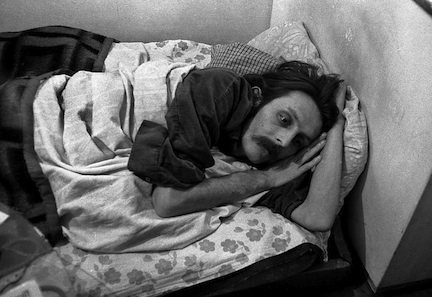 Mladen Stilinović, following this statement, documented himself ‘lazily’ sleeping in 1978. 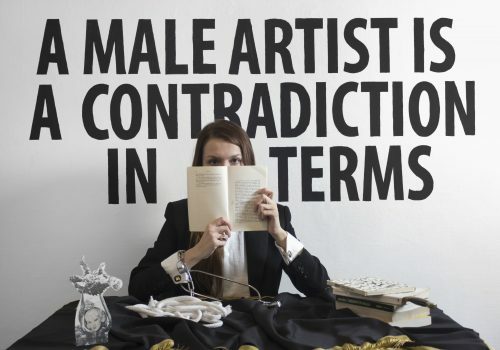 Stilinović has continuously worked outside of market-driven art production by often exhibiting work that is not finished and by asserting non-productivity as critical to the creation of art. In his work, the artist questions the role of the artist within a Western capitalist art system. Stephanie Syjuco’s The Counterfeit Crochet Project (Critique of a Political Economy) is a global collaborative project that looks at contemporary manufacturing and distribution channels. 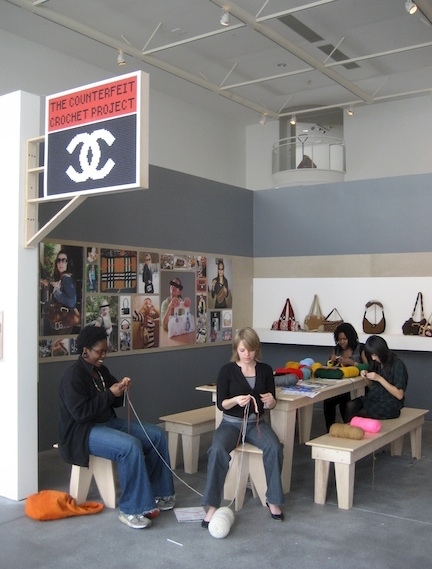 Visitors are encouraged to act as participants in the project by making crochet counterfeit versions of luxury designer handbags. 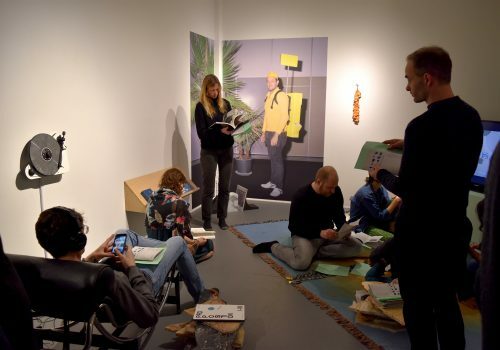 As both a real and virtual collaboration, the project, according to the artist “parallels the idea of ‘outsourcing’ labor, but also adds a democratic and perhaps anarchic level of creativity – within the basic framework, participants have taken liberties with their translations. Makers are encouraged to keep and wear their bags, in an attempt to insert strange variants into the stream of commerce and consumption”. It Can’t Last is a new installation for Factory Workers, and is a monument to impermanence. Jean-Marc Superville Sovak is interested in the idea of building with ruinous material in anticipation of the inevitable. 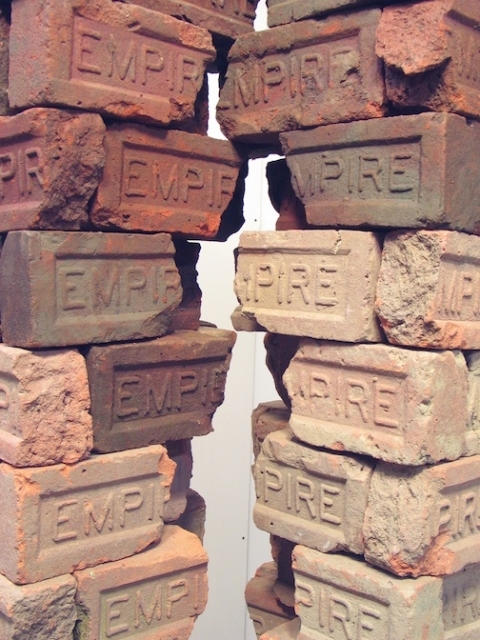 The irony of the inscription of the word ‘Empire’ on the crumbling bricks is symbolic of how the world is being redefined by dramatic shifts in industrial production, which has created new global economic capitals. Chen Chieh-jen attempts to revive the forgotten histories created by a consumerist society. The video Factory refers to the movement of labor markets in search of cheaper production and the dislocation of the employees left behind. Chieh-jen invited workers in Taiwan to their former place of employment, a textile factory that had been closed for seven years. The return of the women to their former jobs in a now abandoned and decaying building is shown together with images of protest at the time of the closing of the factory as well as government produced footage of the 1960s – a time when Taiwan was a major manufacturing center. Scarlet Sails by Factory of Found Clothes (Natalia Pershina-Yakimanskaya and Olga Egorova) begins with young girls sewing a sail that symbolizes their dreams. The girls engage in a fight with an older group of elderly women dressed in a typical Soviet-era style. The older women win the fight and take away the sail, which then turns red and is reminiscent of the red flag in Sergey Eisenstein’s revolutionary propaganda film from 1925 The Battleship Potemkin. Matei Bejenaru, Battling Inertia, 2010, Video. 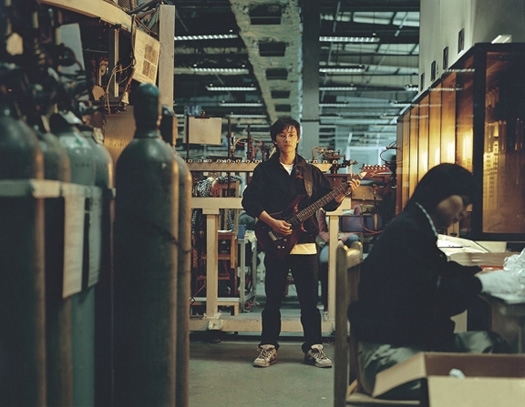 Chen Chieh-jen, Factory, 2003, Super 16mm transferred to DVD, color, silent, single-channel, continuous loop, 31:09 minutes. 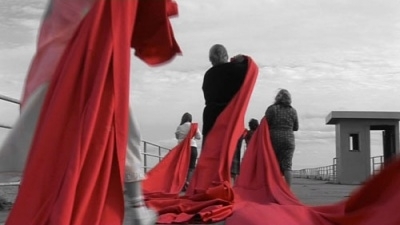 Factory of Found Clothes, Scarlet Sails, 2005, Video, 7 minutes. Cao Fei, My Future is Not a Dream 04, 2006, Digital c-print mounted, 47 1/4 x 59 inches. Jean-Marc Superville Sovak, It Can't Last (Mihrab), 2010, Found bricks. Mladen Stilinović, Artist at work, 1978, Photographs. Stephanie Syjuco, The Counterfeit Crochet Project (Critique of a Political Economy), 2007, Installation with workshop and display area Yerba Buena Center for the Arts, San Francisco. Tania Candiani lives and works in Mexico City and Tijuana, and will present aselection of her recent works related to text, memory andsocial-practice research. Candiani has been developing urban interventions projects where textiles, texts and actions, along with the experiences of the people with whom she works become the detonators ofthe artwork. 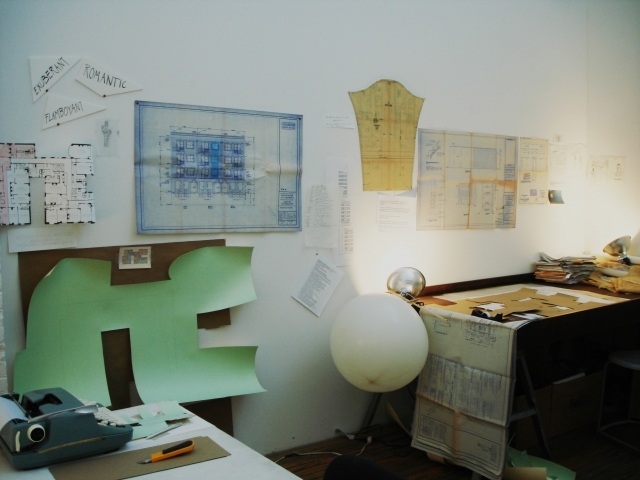 At the moment, she is working on a site-specific project entitled Classic Six/ Apartment Buildings, a multi-disciplinary body of work based on buildings that were emblematic during a particular historical moment in New York City, marking a change in housing tastes and trends by the wealthy. Using architectural plans as a point of departure, Candiani investigates thesculptural elements of architecture, image making, invention, andmemory. Accompanying the talk, Candiani will present a video and a one-daywall installation entitled Ruta Crítica. Tania Candiani´s Salon is supported by FONCA (Fondo Nacional para laCultura y las Artes). Christian Schmidt-Rasmussen lives and works in Copenhagen, Denmark and will present a new work: Untitled (I am posting a letter by throwing it out of the window…), a wallpainting made with chalk and paint in his studio. Schmidt-Rasmussen has been working on the piece during his time at the ISCP, following a theme from his most recent exhibition Daywalker Let go at Overgaden Gallery, Copenhagen. 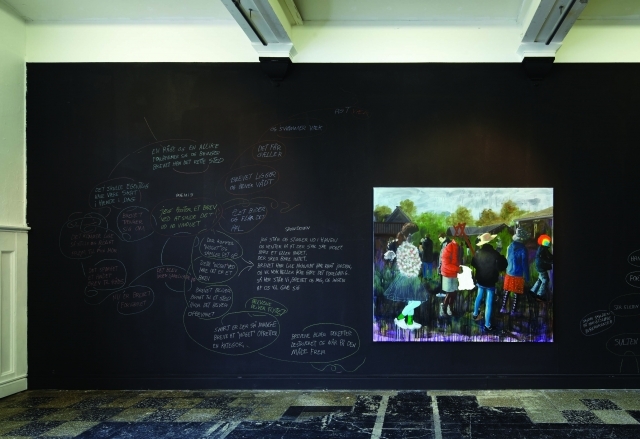 In the exhibition, Schmidt-Rasmussen presented a series of new paintings installed upon black walls, on which small texts were written. A diary written by a vampire, who is the artist himself, was also a part of the exhibition. Schmidt-Rasmussen presented stories from his own neighbourhood in Copenhagen, which represents a classic terrain vague, as well as the rest of Copenhagen and Denmark. Schmidt-Rasmussen’s paintings communicate atmospheres in which the everyday and the trivial are illuminated by the poetic presence of color and glitter, but also by a melancholic darkness. Christian Schmidt Rasmussen, Daywalker Let Go, 2010. 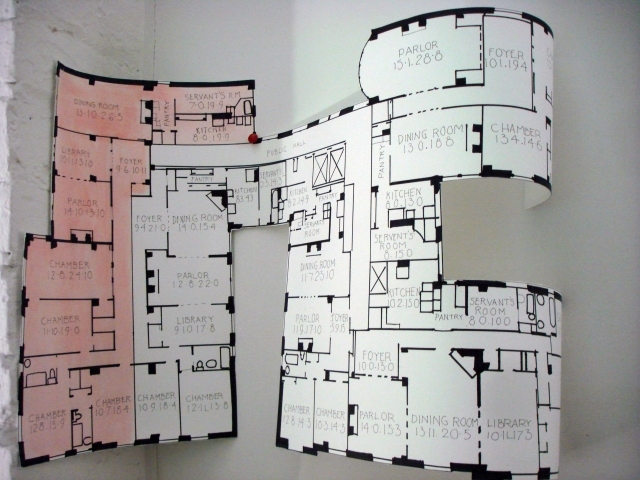 Tania Candiani, The Hendrik Hudson Addition Apartments Broadway and Cathedral Parkway (110th street) Typical Floor Plan. Tania Candiani, Tania Candiani Studio at ISCP, 2010. F4 (Susan Jowsey and Marcus Williams) will discuss their practice from two different angles. Williams will briefly contextualize their individual backgrounds, how their two careers converged into a collaborative ethos and what role their children now play. He will also discuss the collaborative process as it applies to the production of F4’s work. Jowsey will sketch out some of the visual nuances in F4’s recent work as they relate to particular themes within the collective’s practice. Accompanying their talk, F4 will show a multi-component wall installation involving altered photographs. The piece is called “The Suture” and is a product of new exploration and collaboration at the ISCP in 2010. F4 is a conceptual and structural response to the introduction of children into a couple’s partnership; a boy Jesse and his sister, Mercy. The intersubjectivity of collaboration, the mediated nature of socialization in contemporary culture and the implications of power relations in these contexts remain broad themes within this collaborative model. Familial relationships and the investigation of representations of family are particular to F4’s work. Ideas are developed and have been cultivated overtime with specific attention paid to conceptual and visual potential inherent in the prolific creative gestures generated by both children in their everyday play. These can play out through multiple iterations, which may at one time be championed by, one or other of the adults, but always remain the intellectual property of the collective. Szabolcs KissPál will present a selection of videos, installations and objects, as well as more recent projects started at ISCP. Commenting on his own works, he will introduce a wider interpretation of the political, tackling the politics of perception, the politics of representation and that of memory to conclude with the political of the political. 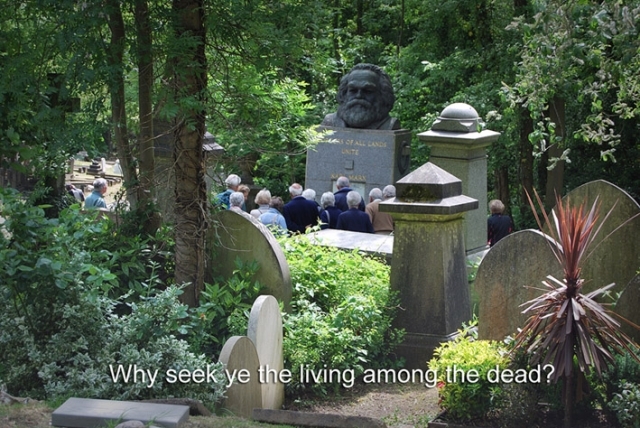 KissPál will speak about what public sculptures look at, what the connection is between Karl Marx and Jesus or between the recent economical crisis and America’s best real estate agent, all of this in the framework of the particular difference between the artist’s precious and the simple workers’ non-precious time. Szabolcs KissPál (born 1967 in Romania) graduated with an MA degree from the Academy of Fine Arts Cluj, Romania, KissPál moved to Hungary where he obtained a DLA (PhD) in 2007 from the University of Fine Arts in Budapest, where he currently teaches (Intermedia Department). His work has been widely exhibited including at the following: Kunsthalle Budapest, Hungary; apexart, New York; Venice Biennial, Italy; Stedelijk Museum, Amsterdam; International Media Art Biennale, Seoul, South Korea. His installations and videos can be found in the collections of the Ludwig Contemporary Museum Budapest, Hungary; the National Museum for Contemporary Art Bucharest, Romania and the Kadist Art Foundation Paris, France. F4, The Preparation , 2010. 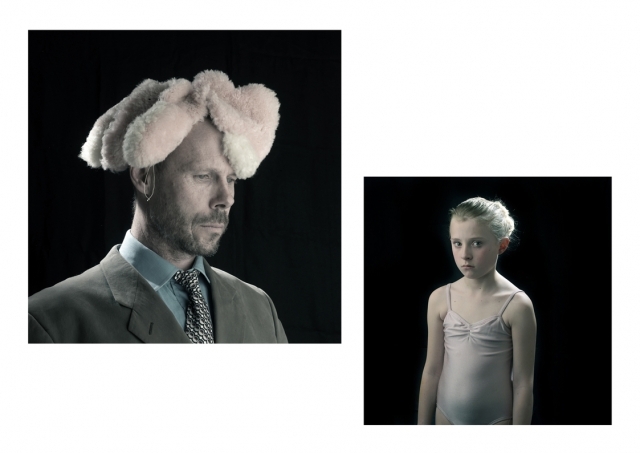 Szabolcs KissPál, Short Stories, 2010, lambda print, 28 x 40 in..